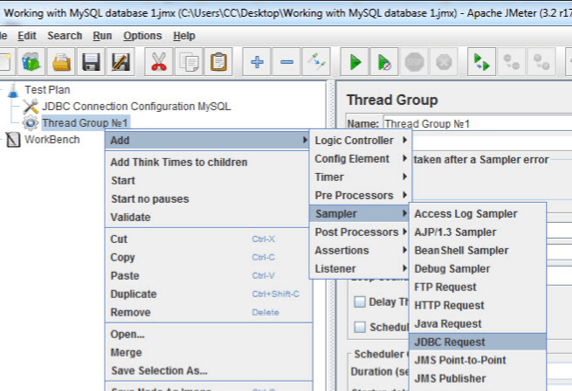 Learn how to initialize database variables and how to assign them values when working with only one Thread Group using JMeter. A variable is an information storage element (for example, storing numeric values, strings, etc.) whose value can be changed. In order to create a variable, it must be declared (specified a name and the type of data stored) and initialized (assigned a value). Creating a variable and assigning a value to it is important for writing test cases that use database queries. This is because we need to get data from the database and also use the values during the execution of test cases. 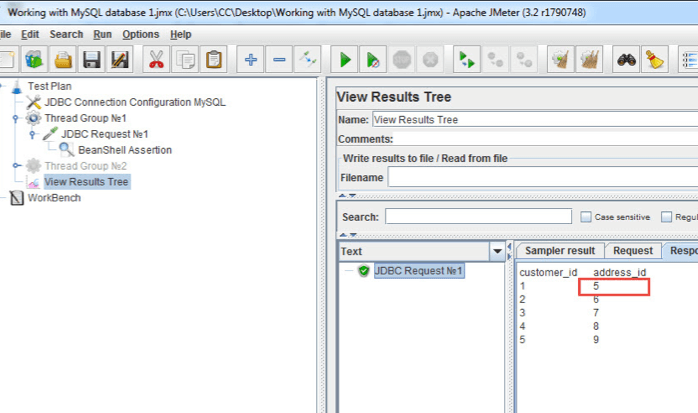 In our last blog post, we created and asserted a basic data configuration to our MySQL database with Apache JMeter™. Now, we are ready to move on to more advanced scenarios. In this blog post, we will learn to initialize variables and assign values to them in a database. We will do this for one Thread Group. Suppose that we have an API that as an input parameter (for example, the "address" parameter) that takes the unique value of the client's address and returns data about the payments made by it. The API takes the payment information from the database. Obtaining the client's ID and the unique value of the customer's address (customer_id, address) in the Customer Table and assigning the data to the variable. Getting a list of payments from the Payment Table according to the value of customer_id. Running an API with a variable that stores the unique value of the client's address. Comparison of the data that the service returned to what is in the database. The verification of the existence of a unique client address value is checked in the Customer Table, where address = address_id. The unique value of the customer address, in the Customer Table, defines a unique customer number (customer_id). The value of the customer_id in the Payment Table shows the payments made by the customer. If the payment exists, the API displays all the data from the Payment Table. If there are no payments, the API returns an empty response. 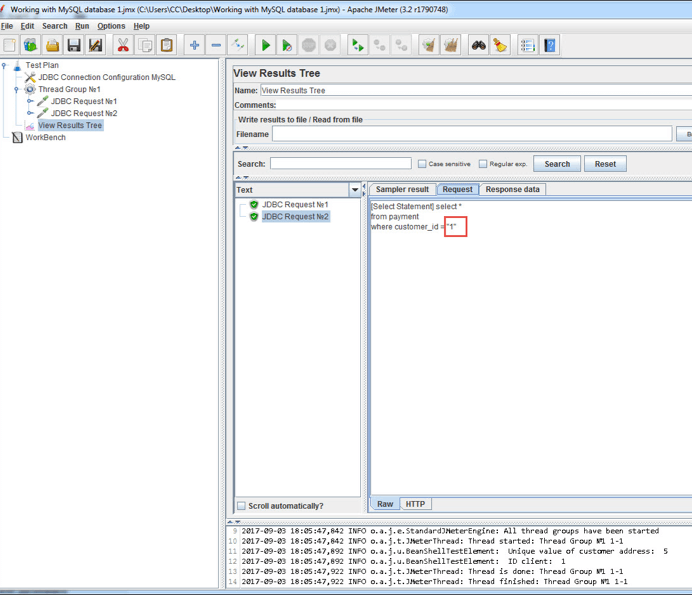 Depending on the architecture that the tester created in JMeter, all four parts of the test case can be placed in one Thread Group, or each part can be placed in a separate Thread Group. 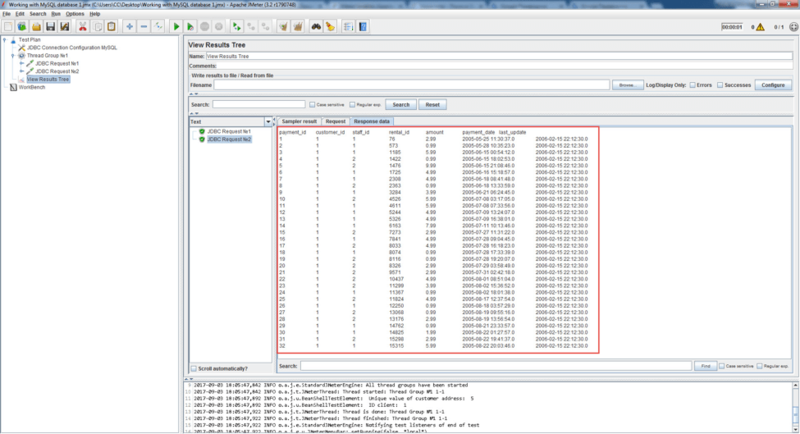 This will determine how the client ID is assigned to the variable. Add a Thread Group (right-click > Threads > Thread Group). 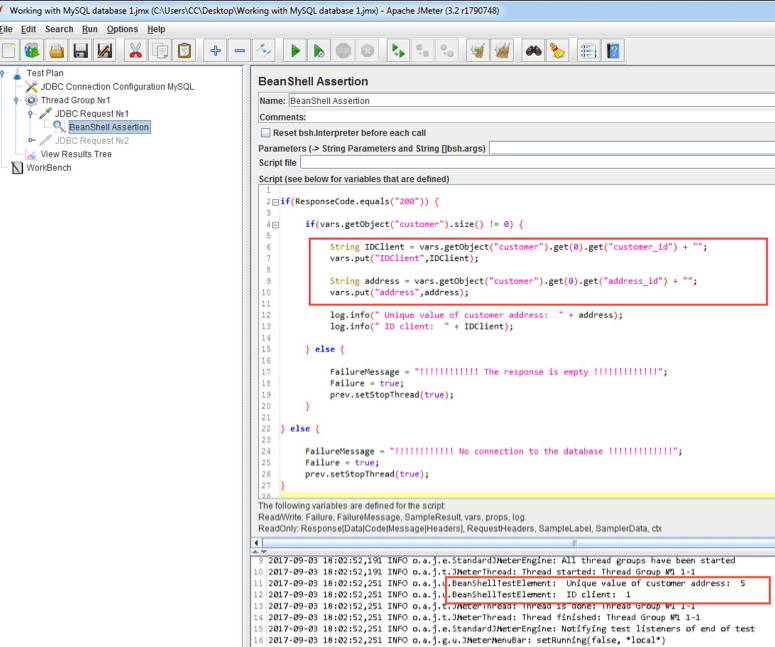 Configure the connection to the database as indicated in the previous article. 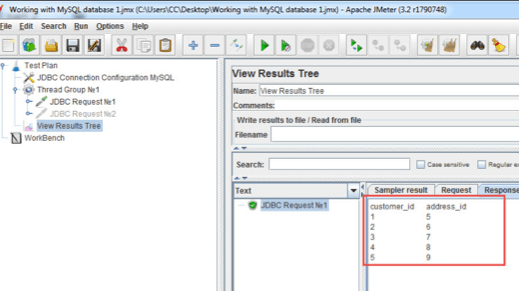 In the Thread Group element, add two JDBC Request elements (right-click on Thread Group > Add > Sampler > JDBC Request). 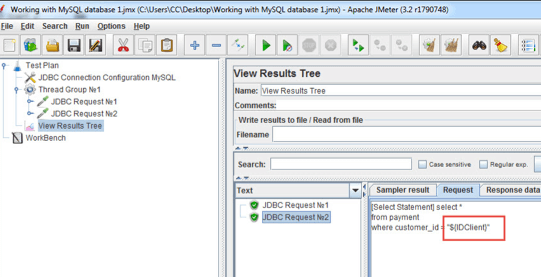 JDBC Request № 1 will implement the first part of the test case. 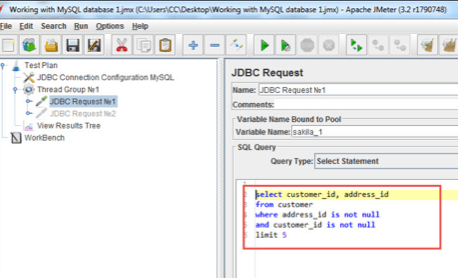 JDBC Request № 2 will implement the second part of the test case. 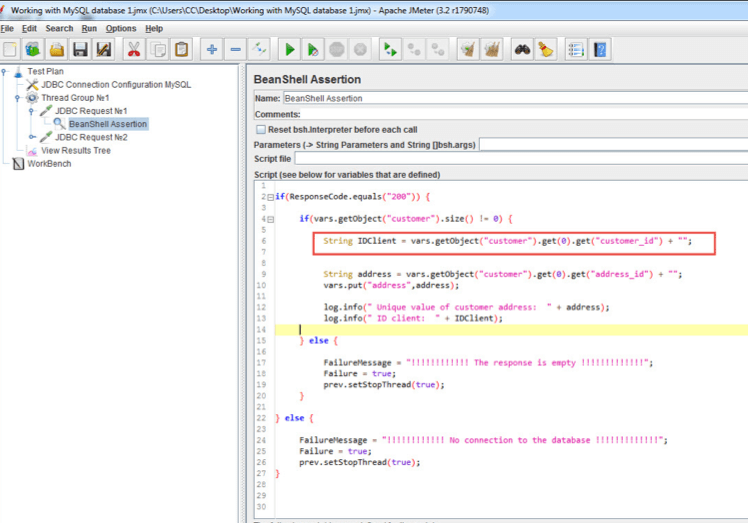 Add a BeanShell Assertion element to JDBC Request №1 (right-click on JDBC Request > Add > Assertions > BeanShell Assertion). Add the View Results Tree element, which allows you to display the responses received from the database (right-click on Test Plan > Add > Listener > View Results Tree). 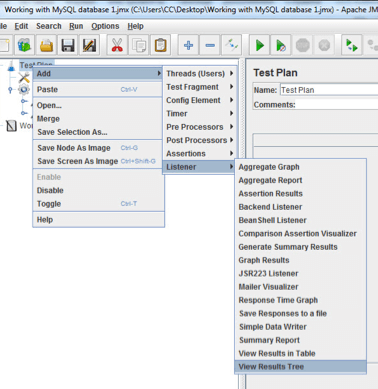 Now, perform a customer search in the Customer Table through an SQL query. select customer_id, address_id: Output fields from the Customer Table only. customer_id, address_id: The remaining fields are not in the output. where address_id is not null and customer_id is not null: Selects only the lines in which the value for the fields address_id and customer_id is filled. limit 5: Displays only the first five rows. Now, we will assign the value of the customer_id variable and assign the address_id of the variable in the BeanShell Assertion to get the results of the specific customer we want. String IDClient = vars.getObject("customer").get(0).get("customer_id") + ""
When the database sends a response, all the data received in the image below is written to the variable "customer". The method vars.getObject ("customer") gets the value of the variable "customer", which is the same structure as in the image. Note that the put()method from the JMeterVariables class is used to create a variable available in any JMeter element within the same Thread Group. Now, we will configure the script so we get payment information from the Table Payment through the IDClient variable. The IDClient variable is converted to a value at the time the request is submitted to the Payment Table. View the results of receiving all IDClient = customer_id payments from the Payment Table. Let's see what happens if you do not use the put() method after assigning the value of the variable IDClient. 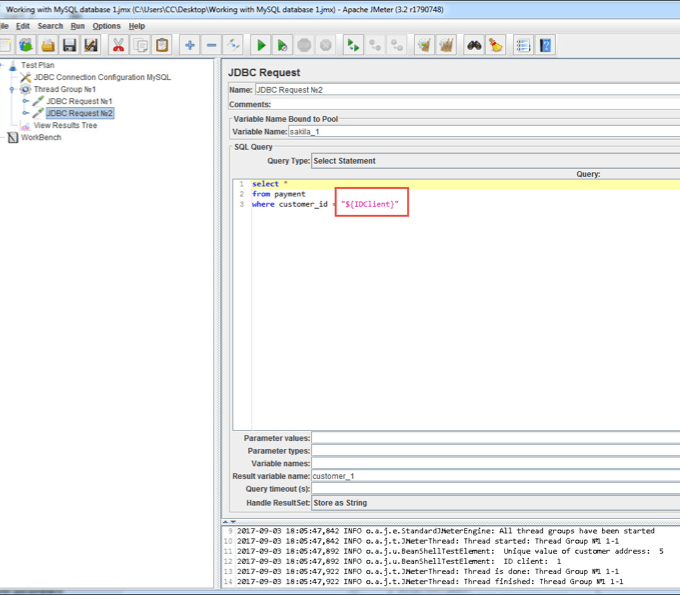 As seen in the image above, the IDClient variable was not converted to a value because the put() method, which allows the variable to be used in other JMeter elements, was not used. Without the put() method, the variable can be used only within the element we are using (in this case, this is BeanShell Assertion). By passing the IDClient variable to the log.info() method, it is converted to a value. If you plan to use a variable in one Thread Group but in different JMeter elements, then you need to use the vars.put(String key, String value) method. 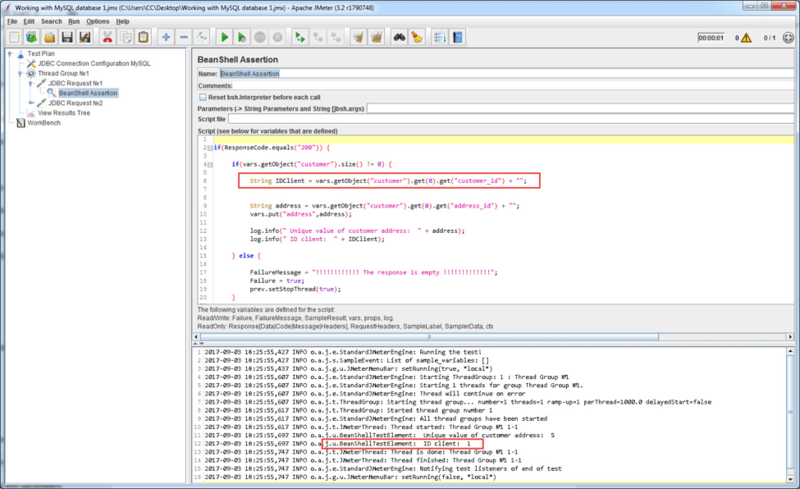 To finish the creation of the test case in JMeter, all that remains is to send the address variable to the API request and compare the results. That's it! You now know how to initialize database variables and assign them values when working with one thread group. Next time, we will show how to do this for multiple thread groups. Published at DZone with permission of Aleksey Merzlyakov , DZone MVB. See the original article here.